Samsung Galaxy A90 is almost confirmed to be the South Korean company's first smartphone with a notchless screen and pop-up selfie camera. Ahead of its upcoming Galaxy A Series event, Samsung seems to have accidentally made a microsite live on its Indonesia website that seemingly confirms that the upcoming Galaxy A90 will feature a notchless screen and will be the only smartphone in the company's A Series with such a screen. Separately, an online report claims that the Galaxy A90 will be housing a battery smaller than the one present in the Galaxy A50. 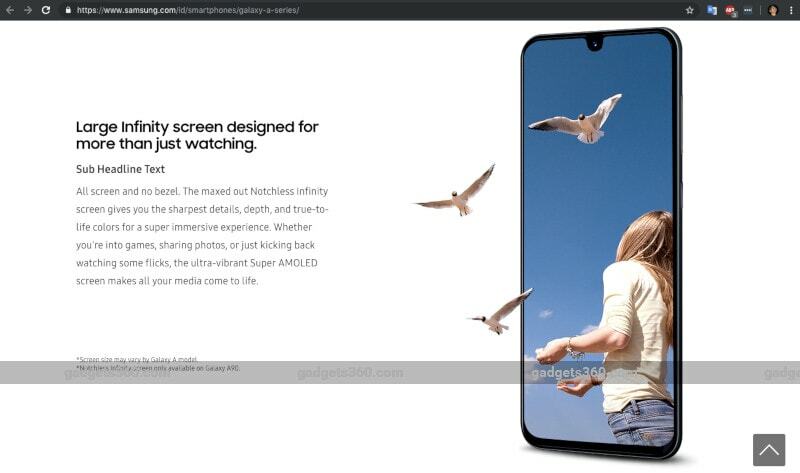 The Samsung Galaxy A Series microsite, which can be found on the company's Indonesia website, seems to be incomplete right now and doesn't include any specifics about the company's upcoming Galaxy A90 smartphone, except that it will have a notchless screen. The listing was first spotted by Dutch website GalaxyClub.nl. Although there is no reference to a pop-up selfie camera on the webpage, there have been rumours about Samsung's plans to include a popup selfie camera in the Galaxy A90. Reports indicate that the Galaxy A90 will also come equipped with an optical in-display fingerprint sensor and might be powered by the Snapdragon 710 SoC, paired with 6GB or 8GB of RAM and 128GB of internal storage. The Samsung Galaxy A90 is expected to sport a 6.41-inch display. According to another report in GalaxyClub.nl, the Galaxy A90 will be packing a battery smaller than the 4,000mAh present in the Galaxy A50. The report doesn't mention a specific battery size. To recall, Samsung is hosting press events on April 10 in multiple cities, where it will be introducing the new Galaxy A-series smartphones. Some of the smartphones that are expected to make their debut on the day are Galaxy A90, Galaxy A60, and Galaxy A70. AirPower Wireless Charging Mat Spotted in Fresh Images on Apple’s Australia Website: Is Launch Finally Near?